The long awaited and anticipated 300x Explorer Solo Adventure Series Kayak is finally here! Now you can do what others only dream of with our most versatile kayak ever! And this one is made for one! We've combined the buoyancy and durability of our Explorers with the ability to maneuver it like a race car through the toughest obstacle course! The 300x stands alone in a class of it's own! Designed to tackle whitewater as well as open-water and surf, this kayak is sure to add years of fun! 1 Adult or 395 lbs. 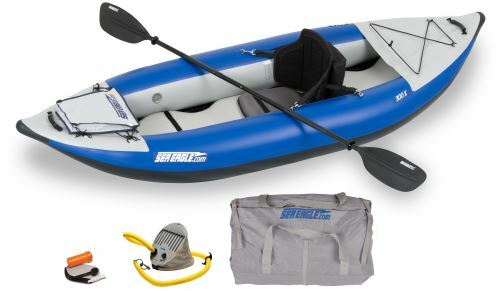 For greater back support our Pro Kayak package features a Tall Back Seat also a stern storage bag for longer trips. A high-performance AB40 Paddle increase power and reduce fatigue.